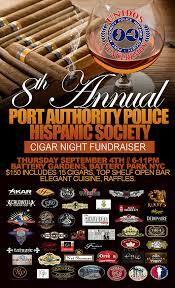 Don’t miss out on the 8th Annual Port Authority Police Hispanic Society Cigar Night Fundraiser. Only 250 tickets will be sold! $150 gets you 15 to 20 Cigars. A 5 hour top shelf Open Bar. Elegant Cuisine, raffle prizes, a year membership to CRA. Live latin band, beautiful venue, great times and awesome cigars. Best part is all the biggest names in the industry! Come meet the cigar icons that will be at the event. I will add companies as they join this massive Charity Fundraiser! This event encompasses the best of this industry! Good people getting together for a great cause, smoking awesome cigars! 100% of proceeds go to helping children!